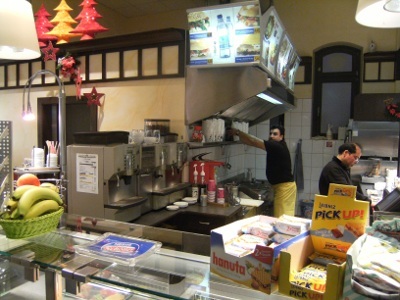 There’s good coffee even at small station in Germany. So here I sit with a coffee at the station Hamburg Harburg. A train is late, so I get the chance to drink a coffee in the station restaurant. It is, as you can imagine, made with the help of a machine. That it tasted good and only cost a little more than one euro will give you an idea of what I want to delve into. There was a time when Uelzen, Lüneburg, Harburg, and Salzwedel all had their own locomotive depots. Today there is one in Hannover and another in Berlin. This clearly demonstrates a massive improvement in efficiency. Machines, electric and efficient have overtaken the unwieldy and maintenance intensive steam engines. That you can jump on a train departing from Uelzen every hour or two in every direction bar Dannenberg is testament to this improvement in customer service. That it is also massively cheaper than in the past, and it is also noteworthy that it is competitive with travelling by motorcar. A freight loco at the Salzwedel roundhouse. By the way, this locomotive is clean when compared to their usual grimy state in DDR times. Only take a look at what has been lost. 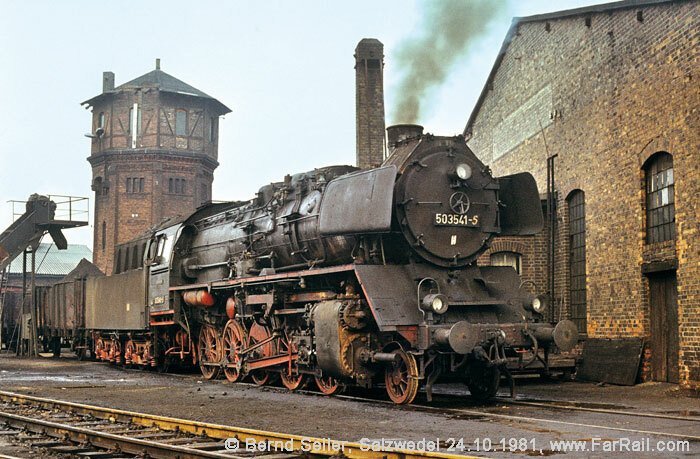 In the 1880s Salzwedel got its first locomotive depot. This was expanded in 1917 and 1921 the final elements being added in 1928. What with crippling underinvestment in the DDR, the shed remained open until the late 1990s, still with steam locomotives into the early 80s. The similar depot in Uelzen – only a few miles away in the part of Germany remaining to the West – had just a few shunting locos by the beginning of the 1980s. Nearby sheds like Lüneburg and Celle would also fast disappear. Simple efficiencies were being made that allowed engines to travel further and need less attention. How many skilled men retired, their jobs simply trimmed for the sake of retaining competitiveness. In the 1940s some 500 men worked at the Uelzen’s depot; the increase in machinery has a direct impact on jobs. The station at Uelzen has now no direct locomotive depot, there is a small maintenance works for Metronom just nearby at the old sidings of the sugar factory. This factory now being supplied by the far more flexible road services, despite their inherent inefficiency when compared to the railways. Making life easier for the manager always comes at the expense of the environment. The marshalling yard at Uelzen was closed at much the same time as the locomotive sheds that closed in 1982. Thirty years ago now. That too was centralization – another way to describe the forces of contraction that so emulate magnetism and gravity in their behaviour. After all, at the immediate, human level there is little to distinguish the action of a magnet on iron and the action of gravity on a stone – save that of scale. They are both invisible after all; both are an expression of the phenomenon of blue. That is to say, of things that have a contractive gesture to their manner. This evening I should have been travelling on the Hamburg to Nürnberg train and travelling as far as Osnabrück. There I change for Hengelo, then Utrecht and home. It will take me six hours, for all the modest delays. In fact, I took advantage of a delayed train from Karlsruhe in the south of Germany to get me to the station at Osnabrück. In the 1950s the journey to Karlsruhe would have taken 13 hours to complete, and even if there was a direct connection, it would have required the locomotive to be changed at several points along the way. Today the train driver may step out of his warm cab, and onto the wintry platform. The train will speed along without a murmur of complaint under the ruling hand of its new driver, fresh on his new shift. This is all to say that systems and systematic thinking which underpins commodity-think has taken its toll of the railways. They are competitive only in bulk and over very long distances. Save across water, the infinitely more flexible lorry has taken charge – that it is far more polluting is of no consequence to the businessman. That the lorry owners are keener to slash prices than the solid German railways is another element in the spectacular growth of road transport. Leaving the lorries the prey of contractive pressures themselves! A lorry from the 1970s was a poor creature compared to a vehicle from today, sleeper cabs were a rare thing in those days when drivers provided much needed work for homeowners willing to let bedrooms to tired waggoners. Comfort and speed – yes, still restricted to 80km/h but far faster acceleration leading to improved timings. Efficiency too, though not by as much as is technically possible. That was a problem in the 1970s too for the technology existed then – only then it was a matter of expense, or just as today, of its simply not being offered. Nevertheless, a single man in charge of one locomotive can move thousands of tons, with practically no effort save that required to stay awake through hours of crushing boredom. Moving such colossal amounts by road would jam up the system completely; there are things that even the keenest of lorry drivers cannot cope with. One is scale. When it comes to moving mountains, you need a train. The problem is that the driver needs to move a mountain just to earn enough to keep his family. Competition – which is a direct result of poor thinking – means that today’s worker needs to control huge machines just to make ends meet. Next Post The Real Meaning Of Christmas.